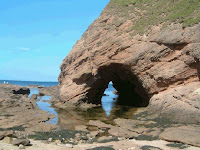 I remember hosting what we used to call an "open air" on New Aberdour beach (Photo) with just me an my old pal Johnny. He played the guitar and sang and I preached as a few curious tourists went past. Don't see Johnny much now but it still brings a smile to my face every time I think about it. Don't forget to make some great memories today. What memories bring a smile to your face?